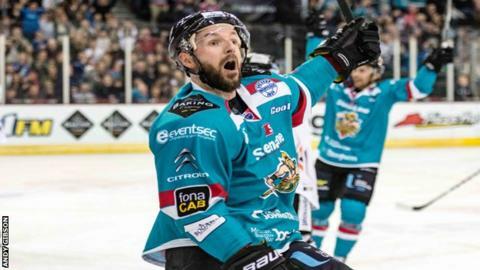 Belfast Giants moved level on points with Elite League leaders Cardiff after earning a 4-1 win in Saturday's grudge match against Sheffield Steelers. Sheffield had been angered after Friday's scheduled game in Belfast was postponed to accommodate a rescheduled concert by pop band One Direction. But on Saturday, Mitch Ganzak and Mark Garside netted early Giants goals. Mathiue Roy replied for Sheffield before Colin Shields and Jonathan Boxill completed the scoring. With their travel arrangements having already been made, both the Sheffield squad and the club's band of supporters were upset at having unexpected time on their hands in Belfast evening as opposed to the scheduled Elite League match. And the unexpected midweek developments after the rescheduling of Tuesday's One Direction gig to Friday at the SSE Arena only increased an already strong rivalry between the two ice hockey clubs. Ganzak put Belfast ahead after only two minutes and Garside quickly doubled the home team's advantage. A lively opening period continued as Roy pulled a goal back for the Steelers but Shields restored Belfast's two-goal advantage after being set up by James Desmarais. After a goal-less second period, Boxill extended Belfast's lead to 4-1 after two Sheffield players had been left sprawled on the ice. Belfast will be back in action on Sunday evening when they are away to Dundee Stars.